Dhaka, 12 August, Abnews: When it comes to healthcare, there are enough number of reasons why men should pull up their socks. Although visiting doctors, going to the gym and having regular medical check-ups is imperative, there are natural foods that are also equally important for a good healthful life. Having said that, meet man's best friend - pumpkin seeds. Also known as 'pepita' or 'pepita de calabaz' (little seeds of squash) in Spanish, pumpkin seeds are creamy; they are an ideal on-the-go snack. These crispy and bite-sized seeds of the pumpkin fruit are available year-round and packed with nutrients that can greatly benefit men's health! According to the study published in Indian Journal of Urology, pumpkin seed ingestion can influence prostate health positively, which is very important for male sexual health. It is commonly used to strengthen the prostate gland and promote healthy hormone function in men. Consuming pumpkin seeds may help with benign prostatic hyperplasia (BPH). It is a condition that causes problems with urination due to an enlarged prostate gland. Various studies have shown that consuming pumpkin seeds regularly may help reduce the symptoms related to BPH. 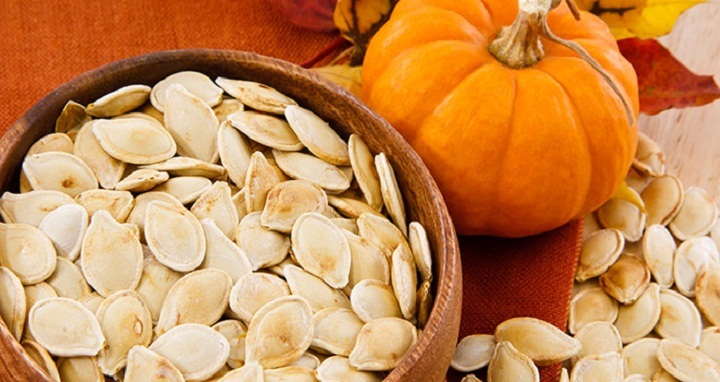 Men can benefit from the zinc found in pumpkin seeds. Reduced sperm quality and even infertility in men may be associated with low zinc levels. Including these seeds in daily diet may help improve overall sperm quality. According to the book 'Healing Foods' by DK Publishing, pumpkin seeds are useful for promoting men's fertility and preventing prostrate problems. The antioxidant content may also play a role in healthy testosterone levels. Pumpkin seeds are rich in protein, which is essential for building and repairing muscle. There are around 23.33 grams of protein in a 100-gram serving of pumpkin seeds as per the United States Department of Agriculture (USDA) nutrition chart. Add pumpkin seeds to any meal or snack for an easy protein boost. Pumpkin seeds are also rich in natural oil. But could eating too many seeds make you fat? The answer is a firm no. "Because of the high oil content of nuts and seeds, one would suspect that frequent consumption of nuts and seeds would increase the rate of obesity. But a study of 26,000 Americans found that people who consumed most nuts and seeds were less obese," notes the book 'The Encyclopedia of Healing Foods' by Michael T. Murray and Joseph Pizzorno. Since pumpkin seeds are rich in zinc, they encourage the renewal of cells, repair damage and promote healthy hair. These seeds are also one of the top sources of phosphorus, which pumps up your metabolism and is important for energy. Pumpkin seeds are also rich in magnesium, which is crucial to a wide range of important physiological functions, like pumping of the heart, relaxation of blood vessels and seamless bowel function. Pumpkin seeds promote sleep and lower depression as they are rich in tryptophan. It is important for men of all ages to become more proactive about their health. An easy way to start is to include pumpkin seeds in your diet daily to help your body thrive and feel your best. However, it is advised to consult a nutritionist before adding pumpkin seeds to diet.